Welcome to the E4K WikiDot! This wikidot site acts as an E4K planning guide for use by the E4K Planning Committee. The E4K Planning Committee should update this site annually in order to reflect the most current information about planning E4K. All necessary information about planning E4K (timelines, files, documents, forms, directions, outlines and more!) can be downloaded via this site for use. Files can be found at the bottom of related site pages. 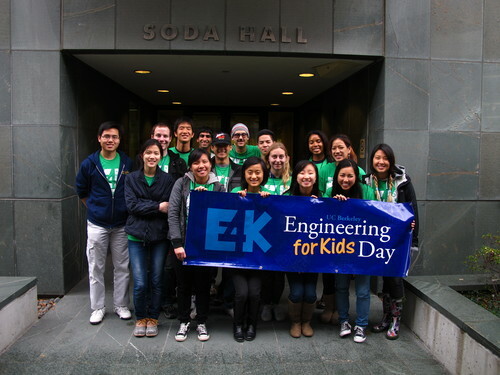 Engineering for Kids Day (E4K) is an annual outreach event hosted by the UC Berkeley Engineering Student Community. E4K hosts hundreds of students in grades 4-6 for a one-day science and engineering education event on the UC Berkeley campus. Engineering for Kids Day is designed by UC Berkeley engineering societies and minority engineering groups with a real passion for their fields. Students interact with undergraduates, graduates, and faculty in fun and interactive engineering activities like making liquid nitrogen ice cream, building bottle rockets, and exploring strawberry DNA. E4K also encourages the participation of underrepresented students in the local community by contacting local outreach programs and Title I schools. Engineering for Kids Day began in 2008 and hosted approximately 80 young students. In 2009, the program grew to 150 kids; in 2010, approximately 200 students participated; and in 2011, approximately 300 students participated with several hundreds more on the waiting list. Most recently in 2012, the program had a registration list filled with 375 students and a waitlist filled with 200 students. On the actual day, 300 students attended, and approximately 125 undergraduates, graduates, and faculty members volunteered at the event, representing 22 different engineering societies and student organizations.